The Ariane 5 and ATV-3 Edoardo Amaldi move from the final assembly building to the launch pad on March 21, 2012, in Kourou, French Guiana. A huge, unmanned European cargo ship will launch to the International Space Station in the wee hours of Friday (March 23) on a mission to deliver a load of food and supplies to the orbiting outpost. The European Space Agency's Automated Transfer Vehicle 3 (ATV-3) is scheduled to lift off from a launch pad in South America at 12:34 a.m. EDT (0434 GMT) on Friday. 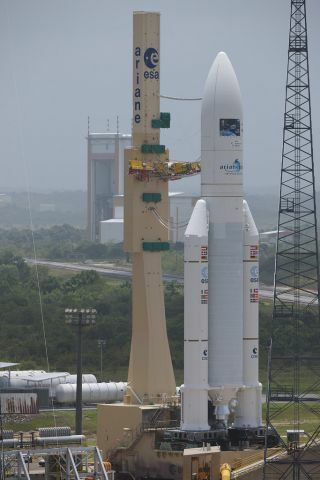 The spacecraft will launch atop Europe's workhorse Ariane 5 rocket from the Guiana Space Center in Kourou, French Guiana. The 20-ton cargo freighter, which is nicknamed "Edoardo Amaldi" after the Italian physicist and spaceflight pioneer, is slated to arrive at the space station on March 28. It is the heaviest load of cargo ever delivered to the station by a robotic spacecraft, ESA officials said. A minor packing glitch earlier this month prevented ESA from launching the mission on its original flight date of March 9. During a pre-flight inspection, officials found two cargo bags that were not properly strapped into place, which required the spacecraft's hatch to be re-opened so the contents could be secured. The cylindrical spacecraft is 35 feet (10.7 meters) long and 14.7 feet (4.5 meters) wide. In fact, an ATV is large enough to fit a double-decker bus inside. The ATV-3 Edoardo Amaldi is packed to the brim with more than 6 tons of supplies, including food, water, clothing, experiments and fuel for the space station. The spacecraft is also carrying memorabilia to honor the physicist who inspired its name, ESA officials said in a video. These keepsakes include a letter that Amaldi wrote to a colleague in the late 1950s. Some of the fuel being delivered to the space station will be used to boost the space station higher in its orbit so that it continues to fly roughly 240 miles (386 kilometers) above Earth. The European ATV vehicles are disposable spacecraft designed to automatically dock to the Zvezda module on the Russian segment of the space station. The cargo ships remain attached to the outpost for up to six months before they are packed with garbage and deliberately sent to burn up during re-entry through Earth's atmosphere. The ATVs are part of an international fleet of disposable robot cargo ships that are used to carry hardware and supplies to the space station. Russia's robotic Progress ships and Japan's H-2 Transfer Vehicles (HTVs) also regularly make trips to the orbiting complex. ESA routinely names the ATV vehicles after historical figures that were influential to astronomy or space exploration. The agency's first ATV, named Jules Verne, made its maiden voyage to the space station in 2008. The ATV-2, dubbed Johannes Kepler, launched in 2011.